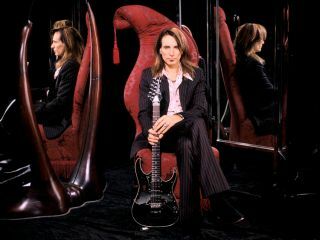 Steve Vai releases a 2-disc live DVD, Where The Wild Things Are, on 5 October 2009 on his own Favored Nations label. Where The Wild Things Are features 2 hrs 40 mins of Vai in concert, filmed in HD at the State Theatre, Minneapolis during his recent Sound Theories tour. The DVD also features bonus footage that includes exclusive interviews with band members and Steve's viral hit promotional video for the Jemini distortion pedal. The DVD contains both 5.1 and stereo mixes, plus a commentary track featuring Vai and some of his band members. The musicians in this band are: Bryan Beller (bass), Jeremy Colson (drums), Dave Weiner (guitar and sitar) and Zack Wiesinger (lap steel). "When I put a band and a show together I try to create an entertainment experience that I would like to have if I was sitting in the audience," explains Vai. "I like to witness great musicianship but nothing too cerebral or overindulgent, I like to be stimulated by a large dynamic range of emotional intensities and melodic richness, I enjoy when people love their instrument and it shows by their oneness with it, I like to feel as though I'm part of a family with the audience and the band, and I like to walk away feeling uplifted and not beat up by somebody's ego or the things they hate about themselves and the world. "And of course I want a cool t-shirt."